Don’t like what you see when you look in the mirror? Do you need something tangible to combat those times when you look in the mirror and don’t like what you see? “Visuals” like me will understand. When we look in the mirror, we see limp hair that never looks good, eyes too large, a crooked nose, ringlets of skin under that chin, thighs a titch too wide for the liking–or SOMETHING not right with our reflection. Call it crazy, but we don’t like the woman staring back at us. Sure, we can have our preferences, but what happens when nearly every time we look in the mirror, we find something wrong versus all that beams right? I used to be the queen of that nest. Man, and what a nasty, dirty nest it was. I didn’t like myself. Critical, belittling thoughts zipped across my brain every.single.time I looked in the mirror. The odd part is that I never even realized I had a problem until the Holy Spirit uncovered a heart issue. Oh, beautiful, wisdom-filling Holy Spirit–I love you! Yep. Call it a heart issue. Not liking ourselves often originates due to a heart issue. But the Holy Spirit stands faithful. His wisdom coats the scene, revealing and healing, then leading us in freer pastures. And girl, when He opens wide eyes to see, we notice things we NEVER EVER EVER realized were clinking around in that heart of ours. And there’s a good chance you’ll be SUPER GLAD the Holy Spirit brings revelation, too. In fact, you might wonder why you waited so long to find this healing and freedom! I’m working on a talk centered on this very topic. A few ladies here in Oklahoma as well as a few in Nebraska will hear it this month. My hope is that the Holy Spirit will reveal heart issues and that these ladies will find healing. Will you pray for their preparation? And will you pray for me as well, that my words will be led by the Holy Spirit and delivered with the power and annointing of His? But that doesn’t answer what tangible something or other we can use for those “I don’t like myself” glances in the mirror. If you don’t like yourself–something you see that ranks as insufficient whether it’s looks, talents, past circumstances/decisions, or more–then grab two things. The Bible–truth–remains sharper than any two-edged sword. It cuts through to the intent of our heart. It leads us in paths of righteousness. And rest assured, being hard on ourselves, belittling that beatuiful woman in the mirror, or sabatoging her by slathering critical words all over her reflection isn’t right by God. It’s a battle, friend. Remember, we don’t war against flesh and blood… (Eph. 6:12). But God Almighty stands as victor…and as Christians, so are we. So go ahead, transfer that trust from self to God. Refuse the negative comments and watch how the Lion of Judah roars in righteousness. This week’s memory verse is spot-on for combating this battle. Grab your sword, girls! It’s a powerful one full of truth. So go ahead, grab PS 139:14 and use it well. Behind it stands the strength of the Lord Almighty. Most 1st and 3rd Tuesdays of the month, we’re here, basking in a new memory verse–ones assuring our TRUE IDENTITY! Join us by subscribing to KristiWoods.net. 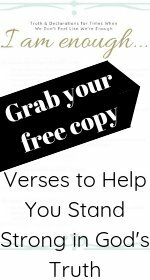 Don’t miss a single verse! Tired of Not Feeling Good Enough? In case last week’s book review sparked excitement, causing you to dance a jig, scale a mountain, or simply click over to the Amazon page only to find More of God: A Distracted Woman’s Guide to More Meaningful Quiet Times wasn’t available yet in print, well, guess what? It NOW IS! Whoooo hoo! Have you ever experienced a time in your life when you didn’t feel loved? I have. My guess is most of us can raise our hand to that question. How do you handle those situations? My love language (from the Five Love Languages) hovers somewhere between acts of service (Whoops! I almost called that “works.”) and words of affirmation. Whenever harsh words from others slice at my heart, I crumple a bit–okay, ALOT– and love flies right out the window. Honestly, it takes me a bit to rebound. But Jesus remains patient as I learn that my feelings don’t affect God’s truth. Ever. We serve a God of love and truth, a Father who desires to see us rebound with His strength. When the world stands against us…God loves. When we land with a crushed heart after our spouse’s affair hijacks our marriage…God’s loves. When our kids walk away from faith and us…His love remains. When words land heavy…His love steadies us. When our dream of marriage never materializes, true love does. Whatever our “when”, God loves. Once a week, Mrs. Kempher floated into the public elementary school for religious ed. I always looked forward to time with the twinkling blue-eyed woman. Her smile advertised sweetness, her quiet voice too. That petite, beautiful woman taught me my first Bible memory verse. In an upstairs classroom, she fed John 3:16 to us students like baby food to an infant. I can still recite John 3:16 from memory. Thank you, Mrs. Kempher. I hope you can hear from heaven. Even more so, thank you, God for your Word and love. Thank you, Father, for propping us up with your Word–even when we don’t feel loved. Thank you for giving us truth that trumps feelings, for being a Rock on which we stand solidly. Thank you for loving us, SO loving us, even though we don’t deserve it. You are a good, good God, and we love you. Now for this week’s memory verse: John 3:16. Pin it, print it, share this post with someone who might not feel loved right now. Whatever you do, grab this verse and run with it. Verse number 2 of 22 sits full of promise–love. The previous memory verse, John 1:12 reminded us, if we believe in Jesus, that we are children of God. Want to print these graphics? Go ahead! (Personal or church-related use only, please.) Simply right mouse click over the graphic. Viola! And don’t forget to download your copy of I AM Enough: Truth and Declarations to Squelch the Voice of “Not Enough” in the subscriber’s library. 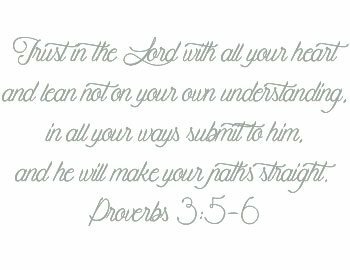 This free printable goes beautifully with this year’s memory verses. If scaling a mountain in high heels appears easier than memorizing scripture (hand raised), then check out these 3 ideas or this post from our friend, Betsy at Faith Spilling Over.